Haven’t done one of these for a while – it’s Deja Food! 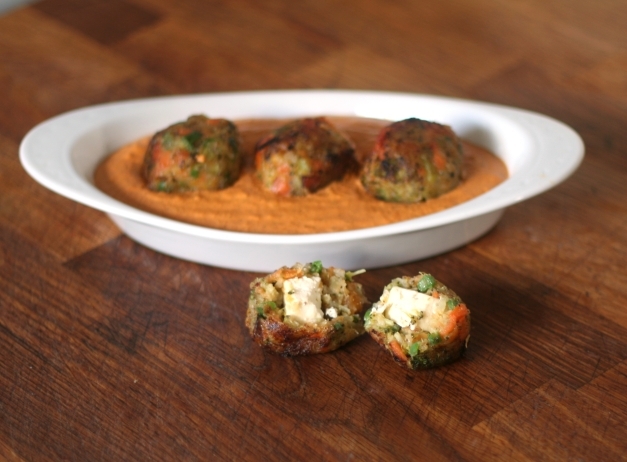 Softly spiced vegetable ‘meatballs’ in a rich and creamy onion gravy. Actually, the ‘gravy’ is worth making by itself – it’s SO creamy and SO flavourful, I could eat it as is with bread to dip and a crunchy salad – Nom! Many Malai Kofta recipes have the cheese grated and mixed with the vegetables and potatoes. I prefer to have a cube of sharp-tasting cheese in the middle to act both as a surprise and to cut through the richness of the sauce. The downside of this approach, of course, is that without the cheesy ‘glue’ to hold them together, the vege-balls are a little less sturdy. Chilling in the freezer and gentle handling whilst cooking on the pan should reduce the possibility of them falling apart. Alternatively, grate the cheese and fold in with the rest of the ingredients. This recipe is perfect for using up leftover vegetables and potatoes, yet glamorous enough to pass off to the family as a freshly-created dish. *poker-face* Not that I’d ever do that. The recipe can be adapted to whatever vegetables you have to hand. Suggestions for alternative ingredients are given in the recipe. Originally published in The Guardian Readers’ Recipe Swap: Meatballs. Serves 4 children, or 4 adults as a starter, or 2 hungry adults as a main course, or 1 peckish adult and 2 ravenous children, or a family of 4 as a side dish, or….you get the gist. Mix together with the salt, pepper, spices and cornflour. Divide into 12 x 50g balls. Make a hole in each ball and press in a cube of cheese. Mould the vegetables around the cheese and shape into a ball. Put the koftas onto a plastic tray and place in the freezer to firm up while you make the sauce/gravy. Peel the onions and the ginger and blitz to a puree in a food processor. Make a puree of the cashews and the yoghurt with a mortar and pestle or spice grinder. Add the onion mixture and fry over a low heat for several minutes until translucent. Add the cashew mixture, spices and tomato paste. Stir for 2-3 minutes until thoroughly combined. Add the cream and milk and stir thoroughly. Bring to a simmer and cook, stirring, for 5 minutes. If you prefer a smooth sauce, give it a quick blitz either with a stick blender or in a liquidiser. Additionally, if the sauce is a little thick, add water to thin it to the right consistency. Return to the pan and set aside to keep warm while the koftas are cooked. 1. Heat 3tbs oil in a wide, shallow pan. 2. Add the chilled koftas and brown them on all sides. Toss gently, otherwise they might break apart. 3. Ladle the sauce into a warmed serving dish and arrange the koftas on top. Alternatively, go crazy and arrange the koftas in the warm dish and pour the sauce over the top. 4. Serve with naan breads to mop up all the sauce. Today we have one of my favourite types of recipe – Déjà-Food! Betcha thought I was going to say Indian? Déjà-Food is my preferred way to describe the cunning use of the leftovers from a previous meal. I’ve always disliked the word ‘leftovers’ as it might conjure up images of plate-scrapings, whereas in actual fact, it’s the food that was cooked but never served. It’s obviously a play on words stemming from the French phrase déjà vu (literally meaning ‘already seen’), but it also manages to avoid any negative conotations of that dreaded word ‘leftovers’. Another reason why I’m such a big fan of Déjà-Food is that it means less work for me in getting a meal together. Cooking potatoes, for example, can take up to an hour to boil, if you’re cooking them whole. With cold, cooked potatoes from yesterday’s supper, this dish can come together in no more than 15 minutes. I’m such a fan of Déjà-Food, if I’m planning ahead (I’m rarely that organised, but occasionally it happens) I will now deliberately cook extra, specifically to use the following day. There are lots of reasons for making use of leftovers, not least the financial, but not many recipes or TV programs actually go to the trouble of showing you just how easily it can be done. Saying “….and you can use the leftovers to make more great family meals” isn’t very helpful if you’re not feeling particularly inspired. Here’s hoping this recipe helps. There are lovely big bags of baby spinach leaves in the shops at the moment, and spinach is so very good for you, you could feel doubly virtuous by whipping this together. Use green chillies by all means if you prefer, I just think the flecks of red look so pretty with the green. Put the ginger, garlic, onions and chillies in a mini food processor and blitz until finely chopped. Cut the potatoes into bite-sized chunks and microwave in a covered bowl for 2-3 minutes until heated through. 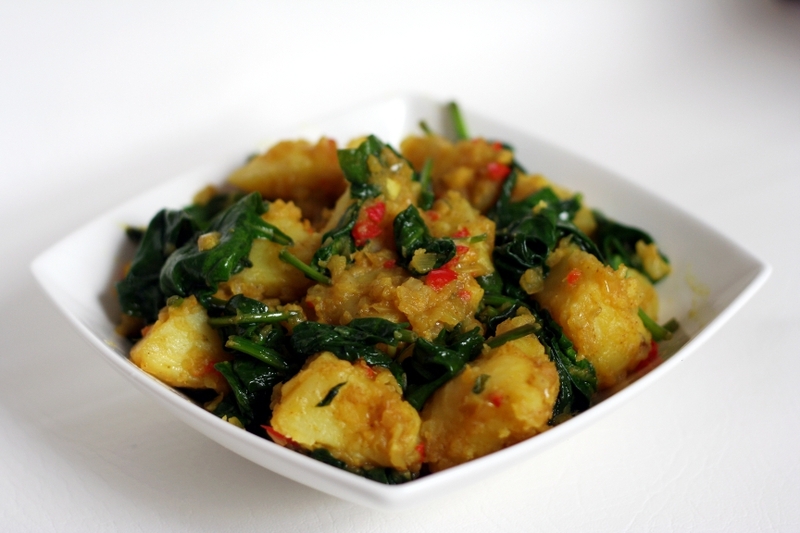 In a large pan over medium heat, add the ghee or oil and then the ginger garlic mix and stir for 2 minutes. Add the spices and salt, stir briefly, then add the potatoes. Turn the potatoes over gently until coated with the spice mix. Add the spinach leaves and remove the pan from the heat. Gently stir until the spinach leaves are wilted but still bright green. The heat of the pan and the potatoes will provide enough heat to achieve this. Welcome to my food blog. I’m hoping to share some awesome recipes, handy hints and tips and delicious menu ideas that I use on a regular basis in cooking for my family and friends. I love a bargain, and feeding my family for pence rather than pounds is always a challenge – so there will be tasty morsels that don’t break the budget, as well as suggestions of what to do with those odd items you pick up because they were on special. A key part of this budget-busting approach will be some great ideas for what to do with Déjà Food (aka leftovers) – I prefer to think of them as advance preparation for the next meal, rather than remnants of a previous one – and if half my ingredients are already prepared, then its going to be less work for me to do. Win! I’m a huge fan of traditional recipes, especially from the British Isles, and believe we could do a lot worse than look to recipes from times gone by for delicious inspiration. Maybe even revive a long-lost dish for enjoyment today! Along the way, I’d like to introduce you to some of the many (nowadays) unsung heroines (and occasional heroes) of cooking that have inspired me, and share some of their amazing recipes with you.